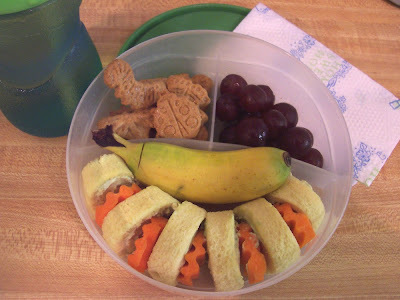 Food allergies make packing a lunch, rather than eating from the school cafeteria, almost mandatory. I've wanted to do some lunchbox posts, but confess to being intimidated by the Martha Stewarts of lunchtime, the bento fans. Margo at Coffee and Vanilla has been hosting a monthly Wholesome Lunchbox event that has finally gotten me to overcome my awe of the bento making mamas and share some of The Kid's favorite lunches. In the photo above is an avocado pinwheel sandwich separated by carrot slices along with Keebler graham cracker "Bug Bites," a mini banana (with a slice at the top to make opening it easier for little hands), and a handful of red, seedless grapes. The bottle to the left is filled with a mixture of half apple juice, half water. 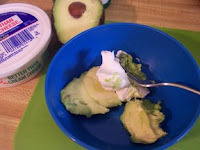 The Kid and I love avocados, and on days when I use one in a sandwich or salad for myself, I'll slice off the side and use it for his sandwich. Just mash the ingredients together with a fork. The lemon juice and nondairy cream cheese will keep it from browning, but it should be made in the morning, not the night before. Stack two slices of bread on top of each other and cut off crusts with a bread knife so that you have two identical rectangles. (That's Arnold Potato Bread in the photo.) Lay them out on a cutting board with the two shorter sides slightly overlapping. 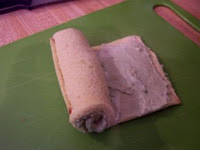 With a rolling pin, roll out the bread to about half its original thickness. Place whatever filling you desire, such as PB&J, sliced turkey, or avocado, on the flattened bread. 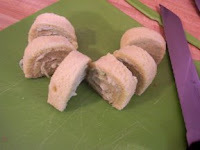 Roll it up like a sushi roll, then slice it into five or six pinwheels. I love the presentation! What kid wouldn't want that for lunch?! 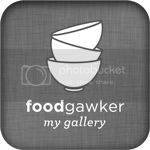 I just found your site and I am loving it. 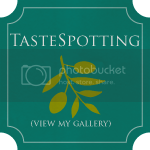 May I add you to my blogroll? I've added you to mine, as well. This is a great idea. I am always looking for ways to get my two picky eaters to eat more! Thanks!